The rapid pace of change in the agricultural industry has placed more focus on information and application technology. One of the critical areas for information and application is crop spraying, where the right advice can save a farmer thousands of dollars while improving gross margins. This best of both worlds scenario is easily achieved by the synergistic relationship between boom sprayer manufacturers and distributors, Croplands Australia, and chemical group Nufarm. Nufarm acquired Croplands several years ago and since then has achieved solid market growth in the boom sprayer market, as well as achieving increased chemical sales. An increasing number of farmers value the Croplands-Nufarm relationship because of the diverse spectrum of spray and chemical products available to suit particular requirements. 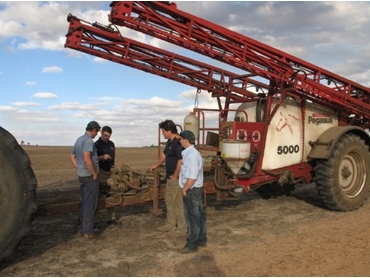 “There’s been a strong demand for our Pegasus trailed boom sprayers, to support this we have spent a lot of time with our dealers doing sales and service training schools to ensure there is adequate backup for those machines," says Croplands broadacre trailed territory manager, Luke Bundesen. “With the information and application technology from both Nufarm and Croplands, farmers can make real productivity gains regardless of whether they own a self-propelled or a trailed unit,” he adds. The Pegasus range of trailed boom sprayers is purpose-built for broadacre spraying and is available in 4000L, 5000L and 6000L tank configurations. It is built for the Australian market with a rugged design, improved boom stability and optional air bag axle suspension. A fully welded chassis design with an adjustable hitch offers maximum durability. The 4000L and 5000L Pegasus are fitted standard with 18.4" x 38" tyres on single wheels and the 6000L on 20.8" x 42". This provides optimal flotation and a huge rolling radius, with load-sensitive self-adjusting air-ride system available as an option. A 180L/min diaphragm pump is fitted standard for excellent pressure range and performance characteristics offering the ability to run “dry” without causing damage. The chemical handling system includes a chemical mixing and induction unit with drop-down leg for safe mixing at the correct height. All Pegasus trailed boom sprayer models are fitted with a clearly labelled, simple to use central control panel, with twin rotary valve controls for all filling, mixing, spraying, and rinsing functions. Pegasus trailed boom sprayers also come with a five-point filtration system, designed for minimising down time, while the chemical handling system includes a chemical mixing and induction unit with drop-down leg for safe mixing at the correct height. CSBP agronomist Erin Cahill, who share farms at Walebing, bought a Pegasus 5000 with a 30m boom to increase his productivity when working on the farm at weekends. He also chose to have an automatic shut-off on the boom to almost eliminate overlaps. “It’s a big feature which is probably saving me between seven and eight per cent of chemical,” says Cahill, who chose the Pegasus because it was a no-fuss sprayer that provided him with reliability and performance. “It’s easy to use and it’s all hydraulics which is something I prefer to electrics. The boom suspension is also very good and it is noticeable how stable the boom remains over a lot of undulating country and rough paddocks. The boom lift provides no worries negotiating gates and fences and is easy to lock in a height clearance for foliar spraying,” says Cahill. Cahill also chose triplex nozzles for flexibility to match conditions and streaming nozzles for liquid fertilisers, and it is here that the Croplands-Nufarm relationship comes to the fore with Nufarm establishing a Spraywise Portfolio to help farmers set up their boom sprayer in accordance with their own management practices. The Spraywise Portfolio allows farmers to match nozzles and nozzle spacings to operating speeds and water volumes, and includes predictive weather models and recommended modes of action of chemicals used. Farmers can configure their own boom sprayer to spray efficiently with less drift using water volumes from 40L/ha to 120L/ha. The Spraywise Portfolio is considered a ground-breaking management tool that is already assisting NSW cotton farmers with drift control issues. With tighter regulatory spraying controls almost certain to be implemented in Australia in the future, the Spraywise portfolio will provide farmers with the necessary data to comply with regulations.